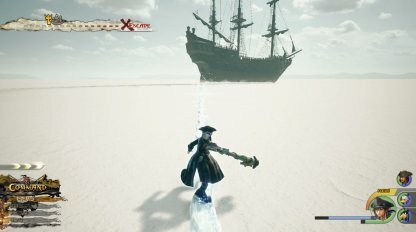 Check out this Kingdom Hearts 3 (KH3) story guide and world walkthrough of The Caribbean! Including map locations, boss fight tips, gameplay tricks, and more! 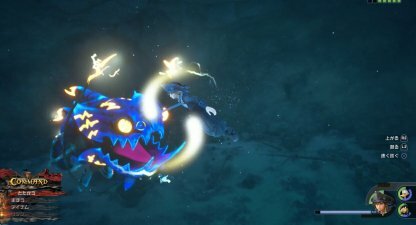 Check Out All Story Walkthrough List! 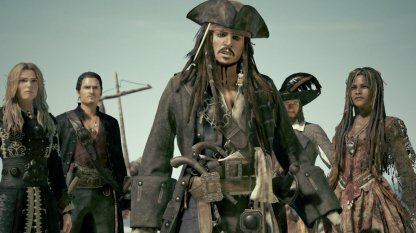 If you aren't able to catch up to the Black Pearl, the game will be over. Use Sora's Blizzard magic to make an ice rail so you can quickly slide down them to get nearer to the ship. 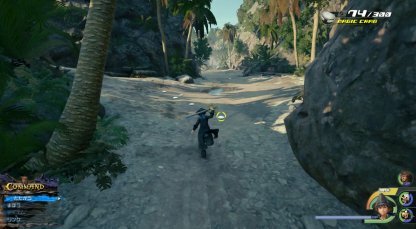 You'll still encounter Heartless when you have to chase after the Black Pearl. Use Sora & Jack Sparrow's attack "Spiral Rush" to easily reach and attack the floating Heartless you encounter. 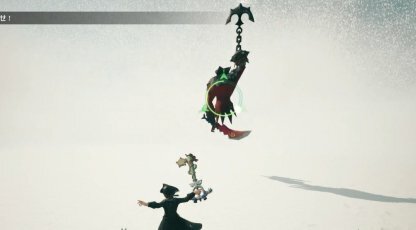 The giant flying Heartless will be hard to hit as it quickly moves around in mid-air. 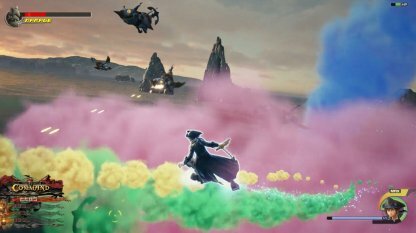 Use the colored smoke around you when you're trying to hit & attack the giant flying Heartless. As soon as you gain control in the Huddles Islands, you can spot a giant treasure chest to your left. This contains the map to the area. 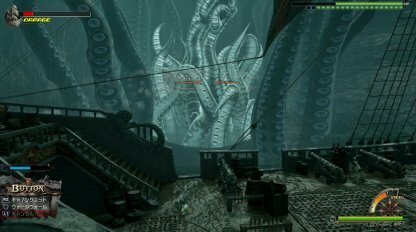 In the underwater encounter with the giant Heartless, it can damage you with electric shocks. 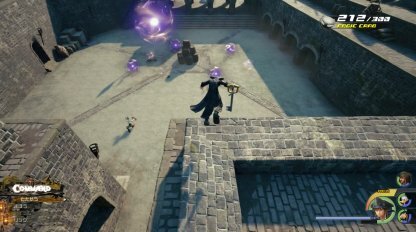 You can dodge it by using the □ button when yellow spheres are circling around Sora. From the small pier head forward until you see a group of people gathered around a vegetable cart. The treasure chest with the map inside is next to it. In this part of the world, go to the middle area of the stone for to trigger battles with the Heartless. When it's over, destroy the wooden barrels & boxes to get a lot of crabs! If you haven't collected enough crabs yet, try smashing more wooden boxes and barrels in the stone fort. If you're still lacking, go to the different corners of the island and check the bases of the trees. 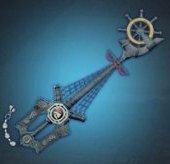 When you're facing the Tentacles in the middle of the sea, aim your cannon shots onto the middles ones. The black Tentacles do not receive damage so it's best to avoid attacking them. 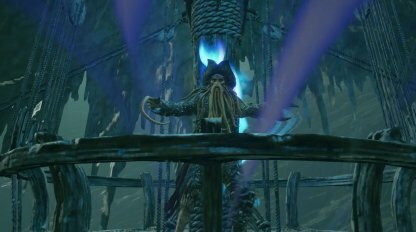 Davy Jones can suddenly attack you while roaming around the hull of the ship. It's easy to attack him as there are large gaps between his attacks. But be cautious as these are far-ranged and can hit you unexpectedly. 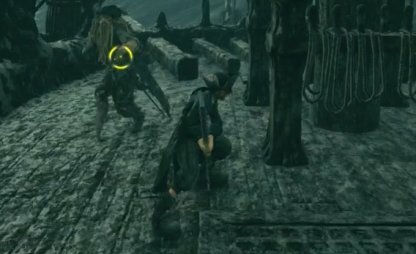 When you've reduced Davy Jones's HP bar enough, he'll summon tentacles that can damage you from many different angles. It's best to keep your distance and use magic or ranged link attacks to damage him.